Dogs have been mankind's loyal and trusted companions for over 40,000 years and are a far cry from their wild wolf origins. No other animal has been able to capture our love and imagination quite like these great creatures. In countless cultures across the world, dogs are considered to be an extension of the family. They are trained to take part in ceremonies and to carry out daily chores. Some farmers train their pets to be a helping hand around the farm, weeding out pests, and hunting prey. This tradition continues even in the upper echelons of society. Fox hunting in England is a sport reserved for royalty and the rich, and the tradition dates back to the 16th century. From Lassie to Cerberus, dogs have always been humanity's constant companions, friends, and protectors. Dogs are often thought of as protectors of the soul and, by extension, guardians of the ethereal plain. Anubis is the ancient Egyptian god of the Dead while the hounds of Annwn guard the gates of the Welsh underworld. Garmr keeps vigil by the gates of Helheim in Norse tradition and, in Mayan and Aztec cultures, a dog was buried with a human sacrifice in order to guide them through the Netherworld. It is believed that dogs are harbingers of Death, especially when they howl at night. Of course, who can forget Lassie keeping little Timmy safe from the harm. Dog lovers the world over can attest to the loving and loyal nature of these animals. After the devastating Japanese earthquake in 2011, many stories emerged of dogs that refused to leave their owners alone, despite the danger. It's no surprise that they are the most popular guide animals for disabled persons. Dog lovers have a special place in their hearts for a particular breed. Whether you love Pit bulls or Rottweilers, Greyhounds, Weiner dogs, Dachshunds, Pugs, or Poodles, each breed has a set of personality traits that owners readily identify with. 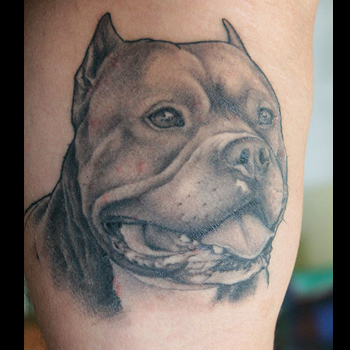 Owners often get tattoos of that pay tribute to their beloved Fido. Some dog lovers choose to use Fido's paw print as a main feature of their artwork in honour of their beloved pooch and as a means of signifying their love and deep connection with their pet. In some cases, getting a Dog Paw Tattoo is part of the grieving process after the loss of a loved animal. Figuring out the right tattoo design for you can be a tricky task, but it may be a bit easier than you think. There are several factors to consider: what your new tattoo will symbolize, where it'll be placed on your body, or what elements will you combine to create your artwork. If you need some inspiration, then visit our design page at www.itattoodesigns.com and take advantage of our Custom Service. Our team can create a unique piece just for you.